* Ships Same Business Day. These replacement parts are intended for use with Caravan Canopy series of shelters only, and specifically for the Caravan Aluma series. These are the characteristics of the Aluma canopy that you need to know: The finish is grey and smooth, the folded height is approximately 5 ft., the material is aluminum, the outer leg diameter is 1 1/4 inches, and the frame weight is 40 pounds. Once you have matched the correct model, simply locate each part which is labeled by letter, and once you have read the corresponding table for the Aluma canopy, you can buy individual parts by letter. 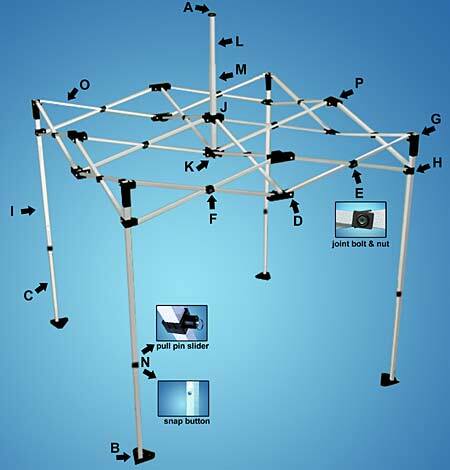 Determine Your Caravan Canopy Model - eCanopy.com Use this video to determine the model of Caravan Canopy you own before you purchase canopy parts. * Please Note: Due to production changes, canopy frame colors may vary from year to year. WARNING: This product can expose you to chemicals including Diethylhexyl Phthalate, which is known to the State of California to cause cancer, birth defects, or other reproductive harm. For more information go to www.P65Warnings.ca.gov. We ship to North America only. As an alternative, if you have family or a friend in the US or Canada who can forward the shipment to you, we can ship to them instead. Is O. Truss Bar for the 10X10 Encore II? 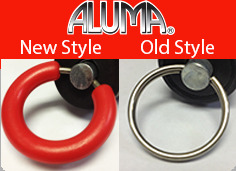 Unfortunately, these replacement parts are for the Caravan Aluma canopies only. We could not guarantee a proper fit for your Encore II. Is the price for one ? The prices are for one part.